Seen through the eyes of a strong-willed and perceptive young girl, Naphtalene beautifully captures the atmosphere of Baghdad in the 1940s and 1950s. Through her rich and lyrical descriptions, Alia Mamdouh vividly recreates a city of public steam baths, roadside butchers, and childhood games played in the same streets where political demonstrations against British colonialism are beginning to take place. At the heart of the novel is nine-year-old Huda, a girl whose fiery, defiant nature contrasts sharply with her own inherent powerlessness. Through Mamdouh's strikingly inventive use of language, Huda's stream-of-consciousness narrative expands to take in the life not only of a young girl and her family, but of her street, her neighborhood, and her country. Alia Mamdouh, winner of the Naguib Mahfouz Award in Arabic Literature, is a journalist, essayist and novelist living in exile in Paris. 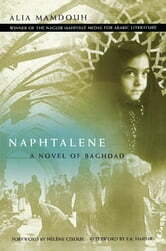 Long banned from publishing in Saddam Hussein's Iraq, she is the author of essays, short stories, and four novels, of which Naphtalene is the most widely acclaimed and translated.